Halych metropoly [Галицька митрополія; Halytska mytropoliia]. 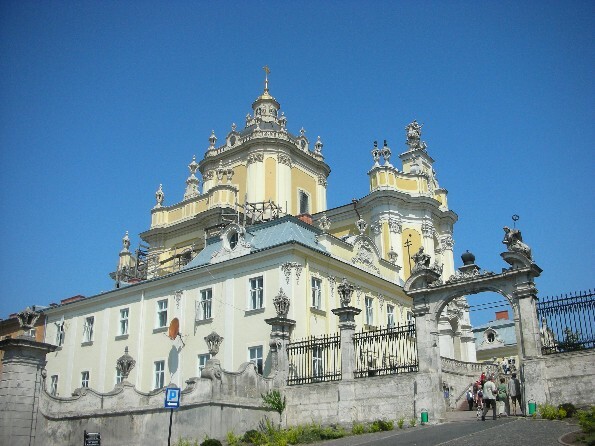 A metropoly of the Ukrainian church established in 1303 in the city of princely Halych. 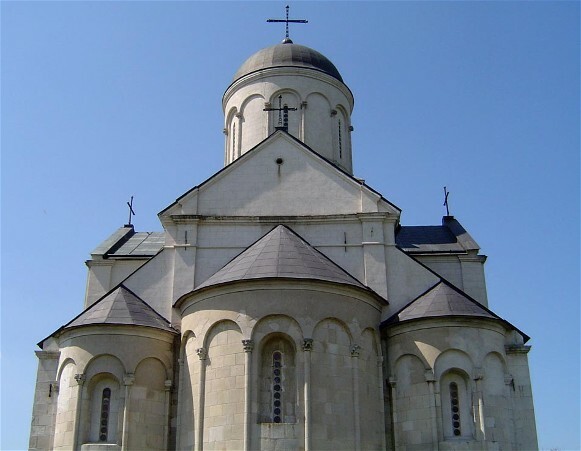 From around 1156 Halych had been the see of Halych eparchy, for which a cathedral was built in 1157. When in 1299 the Kyivan metropolitan Maximos transferred his see to Vladimir-on-the-Kliazma, Prince Lev Danylovych of Galicia-Volhynia demanded the creation of a metropoly in his principality. Lev was concerned that the Kyivan metropolitan would be under the influence of the Suzdal princes, and that he would be unable to devote attention to his distant eparchies. But it was only during the reign of Lev's son, Prince Yurii Lvovych, that the Byzantine emperor, Andronicus II Palaeologus, issued a bull and Patriarch Athanasios of Constantinople a charter granting the establishment of the Halych metropoly. At first it consisted of five eparchies: Volodymyr-Volynskyi eparchy, Peremyshl eparchy, Lutsk eparchy, Turiv eparchy, and Kholm eparchy. Little is known about the first metropolitan, Niphont. He was succeeded by Petro, who was consecrated metropolitan of Kyiv, Halych, and All Rus’ (1308–26) (see Metropolitan Petro of Kyiv), with residence in Moscow (see History of the Ukrainian church). The third metropolitan, Gabriel, died shortly after his consecration. This initiated a period of crisis as the new metropolitan of Kyiv, Theognostos, attempted to suppress the rival metropoly and consecrated Gabriel's successor Theodore as only the bishop of Halych. Theodore appealed to Patriarch John Calecas, and for a brief period succeeded in acquiring the Halych see. Finally in 1347 the Kyivan metropolitan, supported by Prince Simeon of Moscow, prevailed upon the new emperor John Cantacuzenus to formally abolish the Halych metropoly; in 1355 its eparchies were transferred to the newly created metropoly of Lithuania and Volhynia. In 1370 the Polish king, Casimir III the Great, fearing the growing Lithuanian influence in Galicia-Volhynia, dispatched a candidate named Antonii (see Metropolitan Antonii) to Patriarch Philotheos for consecration as metropolitan of a renewed and autonomous Halych metropoly. The patriarch agreed, and Antonii served as metropolitan from 1371 to 1391, but with responsibility for only three eparchies. Upon Antonii's death, the Polish king Jagiełło tried to have Ivan, bishop of Lutsk, named as his successor, but this time the nomination was not confirmed by the patriarch. Instead, in 1401 the Lithuanian metropolitan, Cyprian, was confirmed as metropolitan of Kyiv, Halych, and All Rus’ (see Metropolitan Cyprian). At that time the Halych metropoly ceased to exist (in 1406 the Halych eparchy too was disbanded), and responsibility for local administration was given to vicars, appointed first by the Kyivan metropolitan and from 1509 by the Roman Catholic archbishop of Lviv, with the approval of the Polish king. In 1539 the Halych eparchy was re-established when Makarii Tuchapsky became bishop of Halych, Lviv, and Kamianets-Podilskyi, with his see in Lviv. In 1700, under Bishop Yosyf Shumliansky, the eparchy accepted the Church Union of Berestia. After the partitions of Poland, Russian repression of the Uniate church in its newly acquired territories, which included the de facto abolishment of the Uniate Kyiv metropoly, led the Uniate hierarchy to increase its efforts in securing the re-establishment of the Halych metropoly in Austria-Hungary. This was facilitated by the more tolerant religious policies of the Habsburg dynasty. In 1806 Emperor Francis I officially supported these efforts, and on 17 April 1807 Pope Pius VII issued the bull In Universalis Ecclesiae Regimine restoring the Halych metropoly with two eparchies (Lviv and Peremyshl). In 1885 a new Stanyslaviv eparchy (now part of Lviv archeparchy) was created, and in 1934 the Lemko Apostolic Administration was separated from Peremyshl eparchy. The bishop of Peremyshl, Antin Anhelovych, was consecrated as the first metropolitan. The Halych metropolitan was accorded the same rights as the Kyivan metropolitan as outlined in the 1596 bull of Pope Clement VIII, Decet Romanum Pontificem. Anhelovych was metropolitan from 1807 to 1814. He was succeeded by Mykhailo Levytsky (1816–58), Hryhorii Yakhymovych (1860–3), Spyrydon Lytvynovych (1863–9), Yosyf Sembratovych (1870–82), Sylvester Sembratovych (1885–98), Yuliian Kuilovsky-Sas (1899–1900), Andrei Sheptytsky (1900–44), and Yosyf Slipy (1944–84), who was arrested by the Soviet authorities in Lviv in 1945 and imprisoned until 1963 when he was permitted to emigrate to Rome. The successor of Slipy, Myroslav Liubachivsky (1984–2000), resided in Rome until March 1991, when he moved to his see in Lviv; he was succeeded by Liubomyr Huzar in January 2001, who was succeeded by Sviatoslav Shevchuk in 2011. In the 19th and 20th centuries, the Halych metropoly was a major center of the cultural and civic life of Ukrainians in Galicia.